The last time the folks at Coren Puzzle tried to solve their ludicrous 22x22 custom Rubik’s Cube, the whole thing exploded in their hands. But that was just a minor setback it seems, because they finally having a version that works perfectly—if you have the patience. 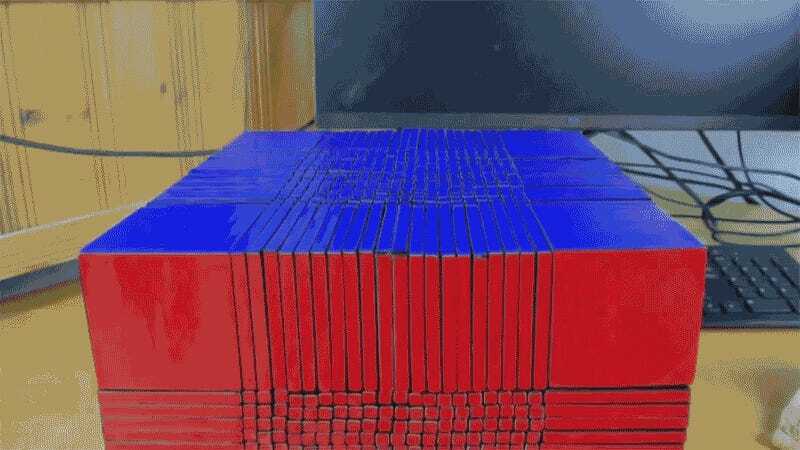 The number of possible ways this cube can be scrambled, thanks to it having 484 individual colored squares on each face, is 4.3x10^1795. There doesn’t even appear to be a name for a number that large yet, although a number with 1,794 zeros is known as a septenonagintaquingentillion—so close enough. To put that in perspective, it took the team at Coren Puzzle over three hours just to rotate the 22x22 cube into a neat and tidy checkerboard pattern. Were it completely randomly scrambled into a rainbow mess, there’s no telling how many lifetimes would be needed to get each side back to a uniform color.